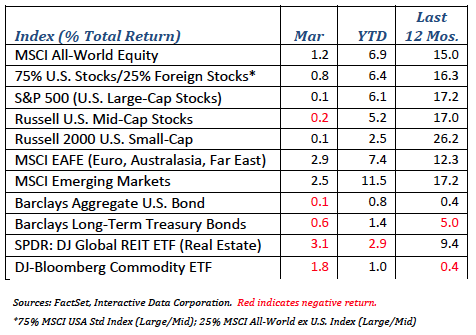 The S&P 500 gained 6.1% in Q1, after eking out a small 0.1% return in March. But it was the international markets that stood out. Emerging market equities gained 11.5% in Q1 and the developed markets outside the US added 7.4%. Some of the outperformance resulted from the pullback of the mighty US dollar, giving foreign investments an added boost from the currency appreciation. The Mexican peso was a big currency winner in Q1, gaining almost 10% versus the greenback. The peso fell under pressure during the election as candidate Trump threatened to rip up NAFTA and build a wall on the Mexican border. With the failure to repeal and replace Obamacare and rumors of only moderate NAFTA reform, it is not a surprise investors are bidding up the peso. Strength in international markets is more evidence the market narratives are moving away from Washington, focusing on signs of improving global growth. Stronger factory activity in China, increased exports in Korea, accelerating inflation in Europe, and higher profits in Japan all indicate a synchronized uptick in activity across the globe not evident for several years. As pressures build on domestic infrastructure stocks, those with high marginal tax rates, and others tied to the “America First” agenda, the global economy continues to chug along. Market commentators have noticed an interesting divergence in economic data of late. The surveys on consumers and business confidence – the “soft” data – is looking stronger than the actual production measures of goods and services, the “hard” data. In order for the economy to grow, consumers must feel good enough to spend and business owners must be optimistic enough to invest. Often, those good feelings do not immediately translate into this quarter’s GDP. The key is to take a broad view of all economic activity. The data will always be noisy, and the trick for investors is to decipher the underlying trend. The S&P was up 6.1% for the quarter, but not all economic sectors performed as well. The spread between the highest and lowest performing sectors was over 19%. Technology led the S&P gaining 12.7% while energy stocks lost 6.3%. Energy stocks reacted to oil prices again falling below $50 per barrel while the technology sector responded to optimism about tax reform and the benefits of their globally diversified earnings. Regardless, it’s not that unusual for such a large dispersion between the sectors. In fact, the difference between the high and low sectors since Q4 of 1989 has averaged 20%. The first quarter of this year is fairly typical. Some cohorts of stocks do astonishingly well, others falter, and the market as a whole continues to improve. Is there any rhyme or reason to these sector differences? There are connections to the macro-economy that influence the relative performance of certain sectors. Consumer stocks benefit from a stronger economy, utilities and telecommunication industries tend to do better during economic downturns, and banks benefit from higher interest rates. These macro themes often drive investors’ sector views, but having a handle on the direction of the macro-economy can be just as difficult as picking individual stocks or sectors. Over the long run, some sectors are in decline while others are growing as the economy evolves. As it turns out, owning the growing sectors and avoiding the declining ones is not as great an investment strategy as it might seem. Researchers Dimson, Marsh and Staunton point out the railroad industry has been in decline since 1900; however, railroad stocks have outperformed the broad market over those 117 years,* beating both trucking and airline stocks, two higher growth industries. The authors conclude investors tend to place too high a value on innovative business models and perhaps too low a value on old ones, providing some evidence a value rotation strategy may work over the longer term. Identifying economic sectors that are growing versus those in decline is not enough to find outperforming stocks. Ultimately, systemic mispricing may arise not from the inability to interpret the economic tea leaves but from behavioral biases that collectively influence market reactions. The difficulty in making sector predictions reinforces the value of a disciplined approach that limits the impact certain groups of stocks can have on a portfolio. A more holistic approach to investing focuses on harvesting long-term returns from a diverse source of market components, including economic sectors, individual stock selection, and from other risk factors embedded in equities. Will stocks take a beating if tax reform goes the way of “repeal and replace”? While there was a mixed reaction in the market to the failure of health care reform, investors have been salivating for months over the prospects for a reduction in corporate tax rates. At the end of the day, what investors really want is economic growth that produces solid corporate profits. While political uncertainty may create noise and temporarily dampen investor sentiment, over the longer term it is a growing economy and the resulting profits that ultimately drives stocks higher. Your long-term plan should anticipate temporary setbacks, like the one for which we may be overdue. Investing is not without risks, but risks can be managed with a good plan and rigorous oversight. Market timing is rarely a good plan or a productive exercise. Whether you are providing for a secure retirement, growing wealth for the next generation, or building a legacy to make a difference in your community, the financial markets can help you achieve your goals. Using the markets effectively requires an unrelenting focus on the long-run and the discipline to stick with your plan, even as the world seems so uncertain. * Dimson, March, Staunton. Credit Suisse Global Investment Returns Yearbook 2017. February 2017.